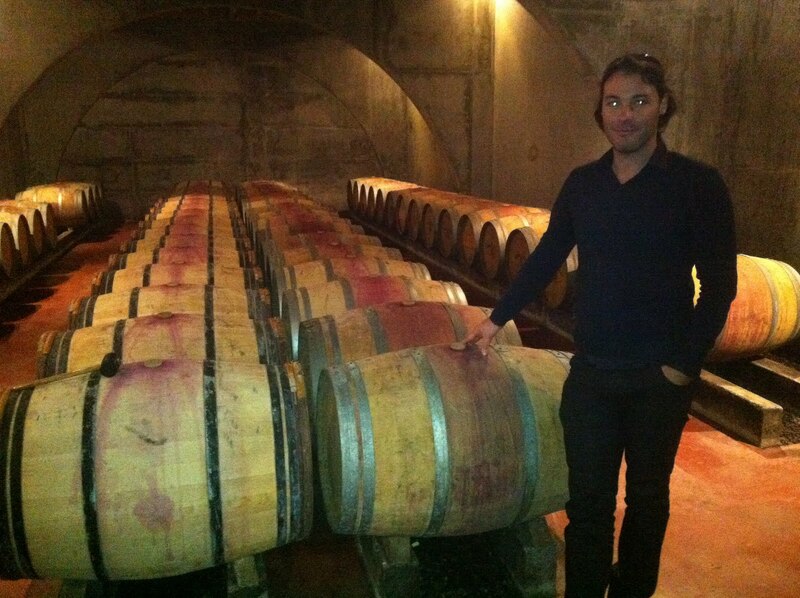 The last of the 2011 barrels were sulphured last Wednesday and so triggered Jean-Marc into action by keeping his promise of our end of harvest winemaker’s trip. Every year, JMS organises a trip for the team somewhere using his vast ex-schoolmate network. They all seem to be someone or another in the restaurant or alcohol trade! This year we were off into Basque country starting out with a trip to Brana distillery and winery in the French Basque region of Irouléguy. We started off early for the long and very winding road to Brana. The usual Bordeaux morning traffic put us an hour behind immediately and all that worried us was being late for lunch! We made good progress down to Bayonne, turning sharply south east and up into the green foothills of the Pyrenees Mountains. The scenery is quite stunning and the green fields, cows, sheep and white houses with red shutters give a very Alpine feel. 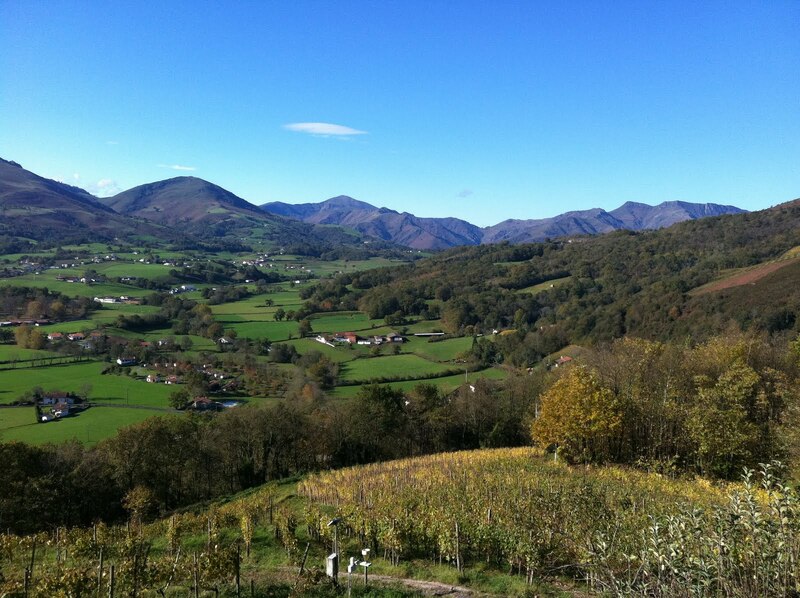 Suddenly we hit the breathtaking Irouléguy vineyards as we entered the town of St-Jean-Pied-de-Port. Irouléguy wine region is not that well-known but it has a wonderful history of being the original birth of the Bordeaux wine region. 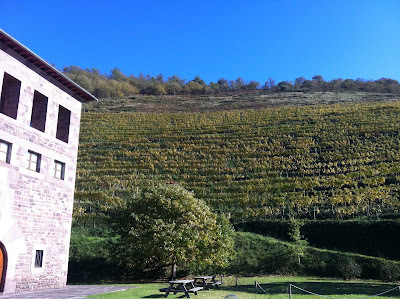 The vineyards are located on extremely steep slopes with inclines of up to 60° at between 100-400m above sea-level. This has led to the development of special growing and terracing techniques by Basque wine-growers to enable the cultivation of vines on these slopes. Soils are mainly red granite rich in iron called bailara gorri (red terrace) with a few pockets of clay-limestone and of the 15 municipalities in the Irouléguy region, only the following nine grow Irouléguy vines on a total of 210ha: Anhaux, Saint-Étienne-de-Baïgorry, Ascarat, Irouléguy, Bidarrai, Ispoure, Jaxu and Saint-Martin-d'Arrossa. The red grape varieties include Bordelesa Beltza (Tannat), Axeria (Cabernet Franc and Axeria Handia (Cabernet Sauvignon), while white wines are made from Xuri Zerratia (Courbu), Izkiriota Ttipia (Petit Manseng) and Izkiriota (Gros Manseng). The area is also famous for its fruit liqueurs, brandy, Eaux de vie (especially poire a pear brandy). Those from the Brana distillery are – for us – simply the best in the region and possibly the world! JMS had managed to get a rendezvous at Brana and we were welcomed by Martine Brana herself and given a tour of the distillery. The Poire here is incredibly pure and as soon as we entered the distilling room the aromas of fresh pear were incredible. The pears grow perfectly in the clean, crisp, wet mountain air and the result is dazzling aromatic crunchy fruit. Once harvested, the pears are taken to the distillery, crushed into a pulp and sent as pear slush to vats in the fermentation room. 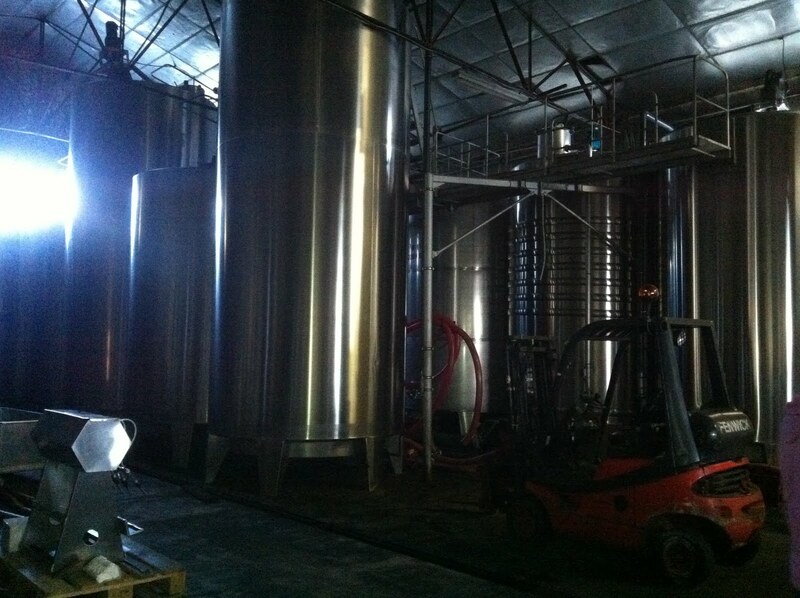 Here the wild yeast begins the fermentation and transforms the crushed pears into a 5% vol. pulpy pear cider. 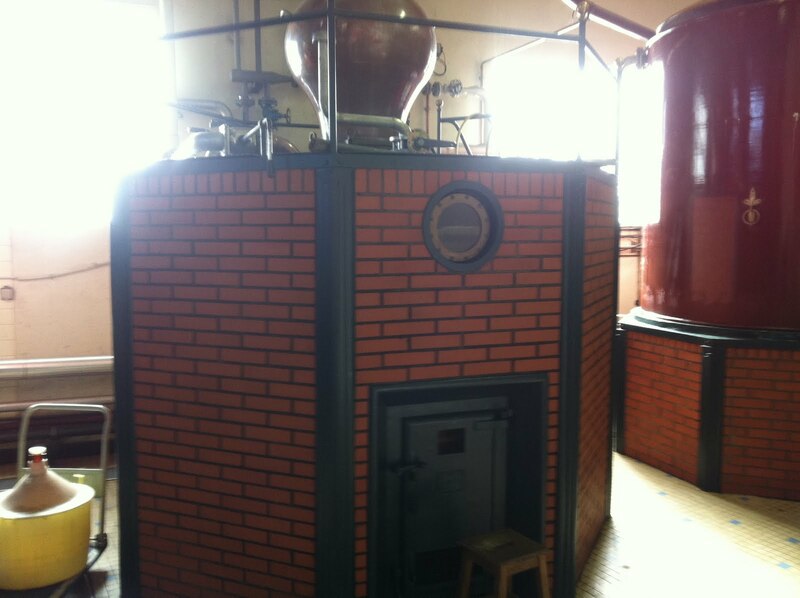 The whole vat is then transferred to the copper pot still where it is heated by a gas flame from underneath until the alcohol boils and rises (taking all the fruit flavour along with it) as a vapour. The alcohol vapour is collected in a pipe in the top of the pot still which leads to a descending copper coil pipe immersed in cold water where the vapour condenses back into a liquid and the clear alcohol liquid flows out at the bottom. The first liquid to flow contains dangerously high alcohols called ‘heads’. 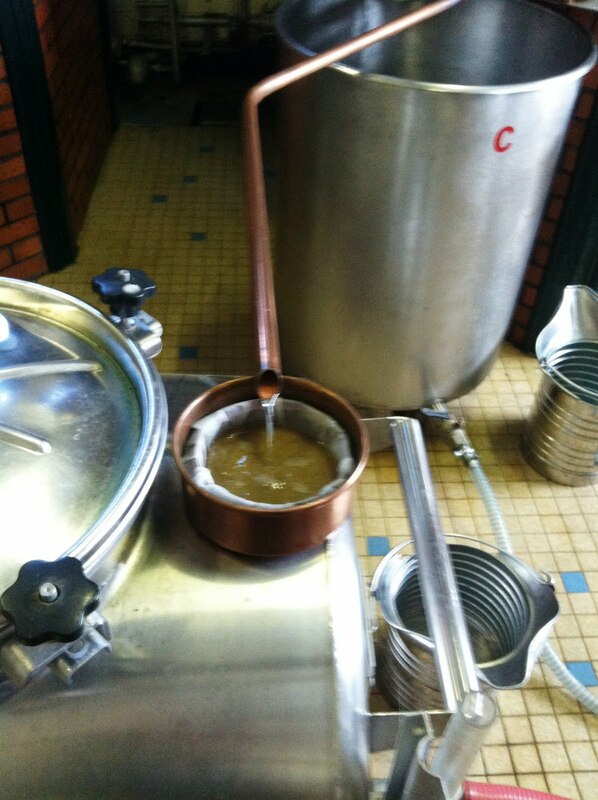 This is collected in a separate vat until the good alcohol and flavour compounds – called ‘heart’ – arrive. Now the taps are switched and the ‘heart’ is diverted to a second vat. As the ‘heart’ weakens, the last to arrive is the ‘tails’ containing unwanted flavours. The tap is switched back and adds the ‘tails’ to the ‘heads’. This process is then repeated with the 100% ‘heart’ to collect an even more pure ‘heart’, this process being called double distillation. The amount of heart collected is tiny compared to the amount of pears harvested but the resulting ‘poire’ is fresh, pure and has an incredible aroma! Martine’s brother ‘Jean’ then arrived to take us up to the vineyards and the winery high in the green hills surrounding the town. 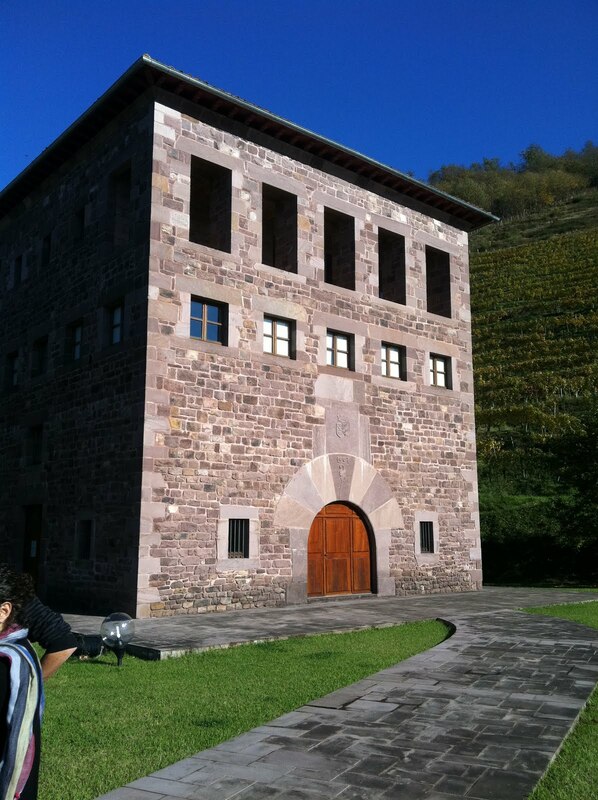 We followed Jean up the winding road until we reached the stunning winery building, beautifully constructed from the local red granite … and what a stunning view! The winery itself is fully underground and the top visible red granite part is a tasting/dining room and accommodation. The stairs led us down to a naturally climatised cellar full of top-notch stainless steel vats made by the highly rated vat maker in Castillon … exactly the same as Le Chai! We headed back to the distillery for a tasting of the wines, brandy and liqueurs. The wines were like none other I have tasted (legendary Petrus winemaker Jean-Claude Berrouet – who is originally from this area – consulted !) They’re stunningly aromatic and the reds have great finesse but need age. We waited patiently for the Poire but not before an Eau-de-vie de prune brandy, the Brana’s cry! Very good it was too, so fruity with lovely oak-barrel ageing. Finally the ice-cold Poire was poured and superb it was. Time for lunch! But only JMS would book a restaurant 300 miles away and in another country! We were off to the famous fish restaurant Kaia in Getaria in Spain. Bon appetite and lunch will be in part two!